One of California's stars in winemaking is Bryan Babcock. He was selected by the Los Angeles Times as one of the "Ten Best Winemakers of the Year". Since 1984 Bryan has been producing wines of from his family owned winery located on the far western edge of the Santa Ynez Valley in Santa Barbara County. The James Beard Foundation chose Bryan as one of the "Top Ten Small Production Winemakers in the World," the only American chosen. 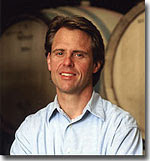 In choosing Bryan for this award, David Moore wrote, "Bryan Babcock best exemplifies the traits I look for in a great winemaker. The quality of Bryan's wines speak for themselves, yet it is his personal commitment to excellence that stands out so much. His relentless experimentation, his willingness to explore the possibilities with so many grape varieties, and his aesthetic are a world apart from the usual American approach to winemaking." And we could not agree more. Bryan is an exceptional talent. We visited Babcock wines right in the middle of the harvest buz and saw the winery in production. The tasting room was filled with guests sampling many of the well known Babcock wines and one guest suggested we experience something very special . We travel the Sta Rita Hills often and it is not very common to find a Cabernet. So we were very intrigued. The nose of this wonderful Cabernet showed hints of violets spice and vanilla. In the glass it was medium bodied and on the palate it exploded with fruit and casis with a long silky elegant finish. The cool climate of Santa Barbara County pushed Cabernet Sauvignon to the background. Since 1996 Babcock winery has been fine tuning a Bordeaux-styled red blend called FATHOM. Once Cabernet Franc based, with the recent development of the warmer "Happy Canyon" area of the eastern Santa Ynez Valley, the program now includes a greater percentage of Merlot, Cabernet Sauvignon and maybe other Bordeaux varietals. The result has been so successful that Cabernet Sauvignon is now one of the key varietals at Babcock Vineyards. "New Epoch Reserve", "Classic Rock Cuvée" are offered annually. Vineyard designated bottling are available under the limited production "Terroir Exclusives" wine club program. In Santa Barbara County many of the best wineries can be found along Foxen Canyon Road. We headed out Foxen Canyon to one of the founding vineyards in Santa Barbara county, Zaca Mesa. The Sun was beginning to set over Foxen Canyon Road and the fog settling into to the valley as we made our way down this well known wine trail. Sounds of music and aromas of some culinary delights brought us to the Zaca Mesa winery for their festivities around the annual “Unleashing of the Bear”. 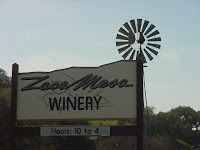 Zaca Mesa is located in the northern most portion of Santa Ynez Valley AVA and is is only 30 miles from the Pacific Ocean. Unlike most parts of the California coast, these valleys orient east-west, opening directly to the cooling marine influences that include morning fog and afternoon breezes making the Zaca Mesa vineyard a unique site for growing grapes. The original property was purchased in 1972 and planted the vineyard in 1973. The vineyard was originally planted with numerous varieties such as Cabernet Sauvignon, Merlot, Zinfandel, Riesling, Pinot Noir, Grenache, Chardonnay, and Syrah. 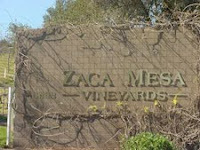 Zaca Mesa was one of the first wineries in Santa Barbara County since Prohibition. As the vineyard grew and viable production began, a winery was built on the estate in 1978 and later expanded in 1981. By the early 1990’s, they found that (Syrah, Grenache, Mourvèdre, Viognier, and Roussanne) grew the best on their site and became decided to focus on the grapes varieties of the Rhône Valley of France. In 1995 when Wine Spectator placed the 1993 Syrah #6 on their Top 100. It is still the only Santa Barbara County wine to break into their top 10. The Zaca Mesa Syrah was served by President Clinton to French President Chirac at the White House. As one of the pioneers in the Santa Barbara County, Zaca Mesa was a training ground for many. Ken Brown was our first winemaker and later started Byron in Santa Maria Valley. Jim Clendenen and Bob Lindquist worked at Zaca Mesa before venturing out on their own to start Au Bon Climat and Qupé, respectively. Other alumni include Lane Tanner, Daniel Gehrs. Winemaker Eric Mohseni graduated from California State University at Long Beach with a degree in food science and a minor in chemistry. 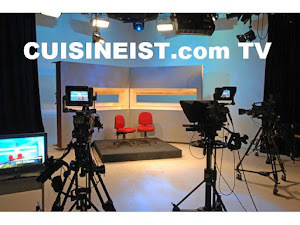 His career began as a wine buyer at The Wine Country, a noted wine retailer in the Long Beach area. In 1999, he furthered his winemaking knowledge by serving as a member of the harvest crew of Esk Valley Estate in Hawke’s Bay, New Zealand’s fifth largest vineyard. 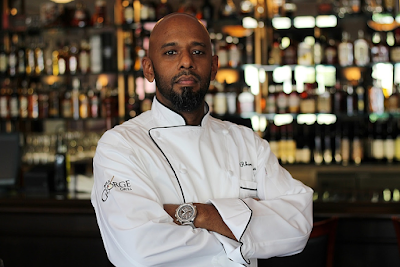 These experiences with launched his passion for winemaking. In 2001, Eric joined Zaca Mesa as enologist. Over the years, he worked his way up to Assistant Winemaker, then to Associate Winemaker and finally to Winemaker in July 2008. Since joining Zaca Mesa, he has helped fine-tune the wine quality and refined the winery’s style resulting in wines that have character, integrity and a sense of place. We joined Brook Williams , President of Zaca Mesa for an exquisite 5-course meal that was paired with the newest releases from the winery. The long-awaited launch of the 2006 Mesa Reserve Syrah and the , 2006 Black Bear Syrah, was shared for the first time. Black Bear Syrah was the first Syrah planted in Santa Barbara County, back in 1978, with cuttings brought over from Chapoutier in the Hermitage region of the Northern Rhône—and still in existence in California. is a single 3 ½ acre block planted in 1978 on its own roots from cuttings brought over from Chapoutier in Hermitage region of the Northern Rhône and named for the many black bears that live around the vineyard. This was the first Syrah planted in Santa Barbara County and is now the oldest remaining Syrah vineyard on the Central Coast. The grapes were hand harvested and destemmed then placed into small 1-ton open top bins to ferment with native yeast. During fermentation, the skins were punched-down by hand three times daily to develop rich color and fine tannins. Once dry, the wine was placed into new French oak barrels to age. After 21 months in barrel and a single racking, the wine was bottled unfined and unfiltered. You definitely remember this wine once you have tasted it. It displays rich blackberry, cassis, mocha, cedar , sage and spice aromas and flavors. The finish lingers from the ripe tannins and smoky oak on the finish. In addition to the famous Black Bear Block we were also treated to the launch of the 2006 Mesa Reserve Syrah. 26 Months in French oak barrels gives this wine a classic old world style. This wonderful Syrah displayed rich blackberry, cassis, coffee and tobacco as well as sage and spice aromas and flavors. The finish lingered from the ripe tannins and smokey oak. This is a full-bodied wine that shows the very special signature of the appellation. Viognier is the Zaca Mesa Estate Bottled Santa Ynez Valley . Viognier is a white grape variety that indigenous to the Rhône Valley of France. The winery has dedicated 37 acres of the vineyard to Viognier. The grapes were hand harvested and began fermentation in stainless steel tanks. Halfway through fermentation, it was transferred to neutral French oak barrels. The wine was then aged for three months, but was not allowed to go through malolactic fermentation. This short barrel aging provides the wine with a classic rich, creamy mouth feel. On the nose, aromas of honeysuckle and peach come through immediately. On the palate this Viognier is dry with notes of ripe apricot, lemon-lime, melon and lychee. It has a lingering finish with a slight touch of minerality. Zaca Mesa has a tasting room that welcomes its guests to taste 5 to 7 of exclusive and most popular wines . They also offer a broad array of artisan cheeses, olives, and crackers for guests to enjoy at one of their many picnic tables in the courtyard. There is even a life-sized game of chess or you can take a short walk on their hiking trail. The tasting room is Open 10am-4pm daily.Extended summer hours Memorial Day through Labor Day until 5pm on Fridays & Saturdays. This dinner, paired with great wines in a beautiful vineyard was an incredible experience to say the least. A drive along Foxen Canyon Road and a visit to this area provides people with a true look at passion in winemakeing that we thought was long forgotten. Join Elaine and Scott Harris of Vino Las Vegas as we speak to Zaca Mesa President Brook Williams as he explains many of the Zaca Mesa wines and enjoy a great dinner at the winery.